Each year in America, nearly 45,000 people are affected by leukemia, a blood cancer. Leukemia is the most common form of childhood cancer, and the survival rate for leukemia varies greatly based on the specific type of the disease. September is leukemia awareness month, and there's no better time to show support for children and adults who are battling leukemia, have fought it, or have died because of it. The recognized awareness color for leukemia is orange, and many people order orange leukemia wristbands for Leukemia Awareness Month. Red is also a popular color to show awareness for all blood cancers. Leukemia awareness wristbands can have inspirational messages such as "4 The Cure" or "Courage, Hope, Strength" Personalized leukemia awareness wristbands can include a custom message showing support for a specific person, such as "Go Team Evan" or "Helping John Beat Leukemia"
According to The Leukemia & Lymphoma Society (www.lls.org), leukemia is a blood cancer that affects the bone marrow. Leukemia develops when blood cells produced in the bone marrow grow out of control. The four most common types of leukemia are acute myeloid leukemia (AML), acute lymphoblastic leukemia (ALL), chronic myeloid leukemia (CML), and chronic lymphocytic leukemia (CLL). Each main type of leukemia is named according to the type of cell that's affected and whether the disease begins in mature or immature cells. Leukemia is the most common type of cancer in children ages 0 to 19 years, accounting for 27.5 percent of all cases. It's followed by neoplasms of the brain and other nervous tissue (17.4 percent), Hodgkin lymphoma (7.2 percent) and non-Hodgkin lymphoma (6.6 percent). An estimated 3,317 children younger than 15 years old will be diagnosed with leukemia in the United States n 2010. ALL incidence is higher in children from 0 to 14 years old than it is in people aged 15 years old through adulthood. AML incidence is lower in children from 0 to 14 years old than it is in people aged 15 years old through young adulthood. An estimated 21,840 persons (12,660 males and 9,180 females) died of leukemia in 2010. Why Buy Leukemia Awareness Wristbands from Amazing Wristbands? Amazing Wristbands is a leading provider of customized silicone wristbands available online, including Leukemia Awareness bracelets. Our wristbands are comfortable, durable, and non-allergenic. Most importantly, our wristbands are your wristbands. Our professional and friendly customer service agents will help you build your customized Leukemia wristbands that will raise awareness and support. We offer a wide variety of wristband types and colors to help your Leukemia Awareness bracelets stand out and make a difference. 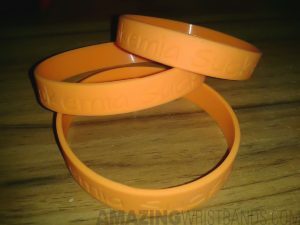 In addition to standard wristbands, AmazingWristbands.com also offers slap bands, adjustable bands, USB bands, silicone rings and silicone keychains. 100% Silicone for your Leukemia Awareness awareness campaign. FREE Shipping for Leukemia Awareness wristbands in the U.S.
FREE artwork and design for your Leukemia Awareness wristbands. FREE Color Matching – choose orange, red or one of our many other colors! Get a detailed wristbands quote for your Leukemia Awareness wristbands in minutes!